Kayn, the latest champion in League of Legends, is one of the most interesting characters to hit the rift in a while. 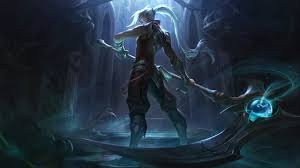 Kayn's lore is not only incredibly dark, but perfectly works in tandem with his kit and playstyle to make a genuinely awesome character, at least in my opinion. Kayn was born a Noxian, conscripted as a child soldier to fight against the Ionians. He was found on a battlefield days after a battle by Zed, who saw the raw potential in the young boy, and welcomed him into The Order of the Shadow. As Kayn grew older and trained in the order, he quickly mastered every weapon he chose to wield. 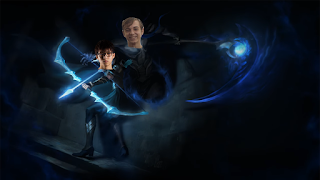 He became arrogant, and this hubris led him to seek out the legendary sentient scythe, Rhaast. 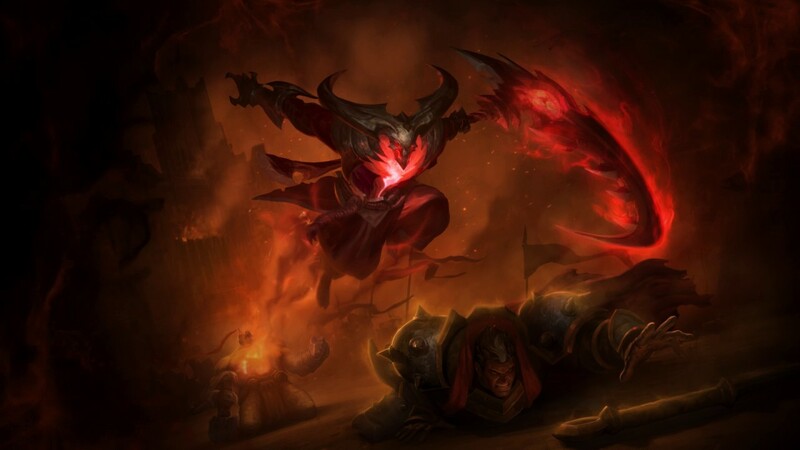 Rhaast is actually a member of the Darkin race, demon-like beings trapped inside weapons for unknown reasons. 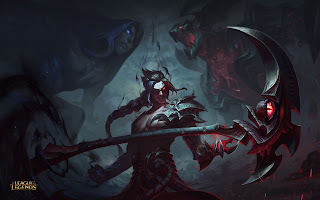 Now Kayn and Rhaast struggle for control, which stylistically has made one of my new favorite champions in the game. Riot released a pretty in depth examination and explanation of the design process behind Kayn, which I definitely recommend checking out. "ZenonTheStoic", one of the game designers at Riot, sums up what I love about Kayn so much in a simple sentence. "This is the first time we've really bound a champion's ongoing story to the gameplay so tightly." I think this is one of League's ultimate strengths, but Kayn and Rhaast really bring this to the next level. Other champions like Ivern definitely drip with style thanks to their lore and kits working in tandem, but Kayn and Rhaast go above and beyond. It's surreal to hear the voice acting talents of Neil Kaplan (Aurelian Sol, Madara Uchiha and Rhaast) and Robbie Daymond (Lucio, Prompto and Kayn) argue pre-transformation, and take control afterwards. Like I said, what makes the lore and design so damn cool is how it works in tandem with his kit and playstyle, so let's touch on that! 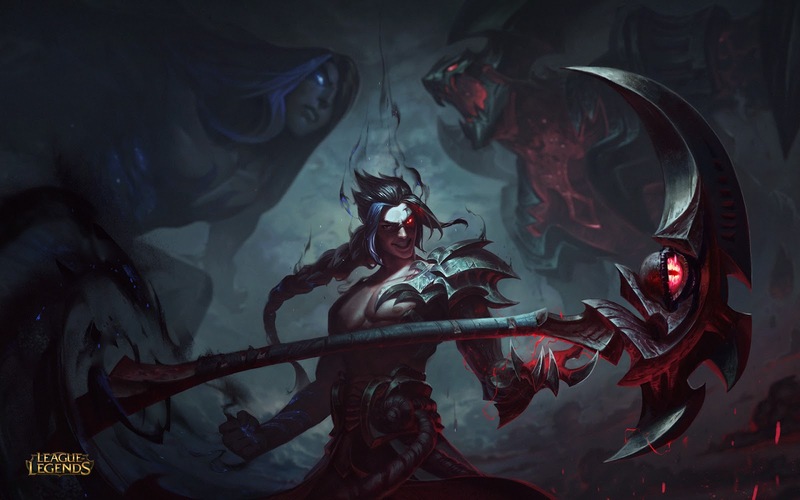 Kayn's passive, "The Darkin Scythe" is what allows him to be overwhelmed by the Darkin Rhaast, or defeat the demon to ascend to the title of Shadow Assassin. During a match, players earn orbs by killing/doing damage to enemy champions, which fill up a gauge above Kayn's portrait. Doing damage to ranged champions fills the bar with Shadow Assassin orbs, while damaging melee champs fills the bar with Darkin Orbs. Once the gauge is full based on what kind of champion you damaged the most, that transformation becomes immediately available, while the other transformation is only available after a 4 minute wait. 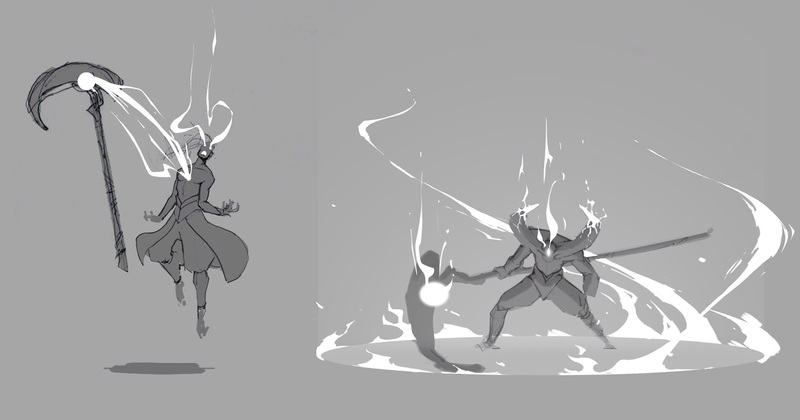 Once players choose a transformation they acquire a new passive based on the form they chose! I'll discuss more tactics for each form a bit later, but the passive really sets the stage for each playstyle. Whenever Kayn deals damage to enemy champions he also deals 12% - 44% (based on level) of post mitigation damage as bonus magic damage, lasting for 3 seconds upon entering combat with a champion. Rhaast heals for 26% - 43% (based on level) of the post mitigation damage that he deals with spells against enemy champions. Kayn rushes forward, dealing damage to all enemies he passes through, then flourishes his scythe, dealing the same damage in a circle around him. Kayn sends out a long and narrow skill shot directly in front of him, dealing damage to all enemies in a line and slowing them for by 60%, decaying over 1.5 seconds. Kayn gains 40% movement speed and becomes ghosted. He can also ignore all terrain collision for 1.5 seconds. (He can enter walls!) Upon entering the terrain, Kayn immediately heals for a flat amount +40% bonus AD, and as long as he is not in combat, the duration of shadow step is extended. Any immobilizing effect will interrupt Shadow Step. Whenever Kayn deals damage to an enemy champion, he marks them with Umbral Trespass. 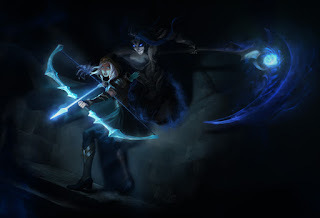 Kayn can "infest" a target marked with Umbral Trespass, revealing the target and becoming untargetable for the duration. Upon reactivation, or after 2.5 seconds, Kayn violently rips free from the target's body, dealing damage and being sent in the direction of his choosing. It's important to note that these abilities are purely the base (or untrasformed Kayn) versions. Once you transform some abilities gain different properties, both major and minor. I'll touch on these below. Before that, I'd like to touch on Kayn's standard kit and how to utilize it in the early parts of the game. His kit is easily one of my absolute favorites in the game, and for a lot of reasons. While I believe Kayn can be played in multiple roles, (made very clear by Fnatic's midlaner "Caps" in an EULCS game last week), I think his kit is tailor made to hit all the requisites of an incredibly strong jungler. In the early game your very precise objective is to earn your transformation, and that's by utilizing your pretty potent early game base stats and abilities to earn those orbs. Kayn's Q not only allows for some insanely fast AOE clears and burst damage but it can also be used to traverse terrain and move around faster. Blade's Reach is an excellent poke in lane, and can be used to get some extra orbs on the backside of a trade, but it's ultimately straight forward. Shadow Step is easily the most unique and "gimmicky" ability in Kayn's kit, and puts his ganking prowess on a whole different level. I would almost compare his ability to materialize a gank from nothing similar to Zac's. Nothing is more frustrating then trying to gank a lane that is covered in control wards, and your team hasn't been able to clear them. It really opens a lot of doors when you can force a gank by walking though walls (who would've thought!?). Umbral Trespass is a very interesting ultimate in the sense that it does little damage and honestly has little impact on a team fight, however it's incredible for dodging major abilities and avoiding damage while you get your cooldowns back, as well as re-positioning, extending the fight and netting you even more orbs. The pretty well accepted standard is to have your transformation by 12 minutes in, meaning if you have to wait for the secondary you'll have it by 16 minutes. Ideally you would be able to manipulate your ganks to earn the transformation you intend to, but sometimes things just happen, like fending off an invade, or seeing a free easy kill on a champion opposite of your intended transformation. Playstyle, win con, item build and general tactics change drastically based on the transformation you choose. Let's talk about it! You may have heard people say that this form is much more powerful...well that's because it is. At first glance of Rhaat's passive it may seem like the only reason to go Rhaast is because of his ridiculous ability to heal, and while that's somewhat true, Rhaast can also lay down some ridiculous damage, even more then SA Kayn in some cases. Rhaat's Q, Reaping Slash, earns an additional modification of, "50% AD (+5% (+4% per 100 bonus AD) of target's maximum health)". I know, I know MATH, but essentially, based on your target, Rhaast's Q is doing an absurd amount of damage on top of healing you as well. While Rhaat's E, Shadow Step, is unchanged after transformation, his W gains an incredibly important property. Blade's Reach now knocks the target up for 1 second, on top of the healing passive, which allows Rhaast to extend fights and buy even more time for his carries to do damage. It also goes without saying how extremely valuable some extra CC is. Umbral Trespass also benefits pretty heavily from Darkin form, gaining the modification of dealing 10% (+ 13% per 100 bonus AD) of targets maximum health. That's a huge chunk of a tank's health! Obviously, all this healing and extended fighting is extremely valuable to the team as a whole, especially when you get ahead. As Rhaast, you're very capable of being a solid brawler in teamfights, peeling for your team and chunking tanks and carries alike. He may not be capable of deleting carries 0-100, but you'll be much more capable of surviving any damage they throw your way. This build path is generally what I build every time I plan on transforming Rhaast. As I mentioned, I think it's pretty valuable to plan ahead of time for the transformation you plan on taking, and I start early by building towards Cinderhulk, which helps Rhaast be a frontline menace for your team. Outside of the boots, I would also reccomend the sixth buy being some sort of tanky item based on the opponets damage, whether it's Maw, Thornmail, Guardian's Angel or even Randuin's. However, even if the enemy team doesn't have a ton of AP, I value Spirit Visage really heavily. That 30% increase to heals is massive for Rhaast. That's right, I even plan my masteries ahead of time! Nothing special here, in fact I think most people would agree this is a really standard Kayn page, regardless of the form you take. I'm definitely open to discussion on this one, but I run the same runes for both transformations. I think Runes definitely come into play more in the early game, especially when jungling. Attack speed to help clear, raw AD for gank power and some tank stats so I don't blow up! SA Kayn is undoubtedly a whole ton of fun to play. I would go as far as saying SA Kayn feels more like an assassin then even Zed and Shaco do! This is due to the tweaks in his kit to reward players for thinking like an assassin and prowling around the map like one. SA Kayn's passive means he gets bonus damage for getting the jump on his opponent, but after those 3 seconds are up his damage will go back to normal, without the benefit of Rhaast's lifesteal. So that means you want to strike hard and fast as The Shadow Reaper and execute your opponent before they even knew what hit them. This is made even more possible by the modifications made to Shadow Step via SA transformation. When you enter terrain with Shadow Step, SA Kayn's movement speed gets cranked up to 70%, which is almost double his base movement speed. He is also immune to slows while in terrain. Kayn's Q is unchanged in SA, but Blade's Reach gains some properties that really allow you to pile a ton of damage on really quickly. While in SA form, Blade's Reach's range is increased by 200 (holy crap) and deals an additional 10% bonus AD, while the slow decays over 2 seconds. 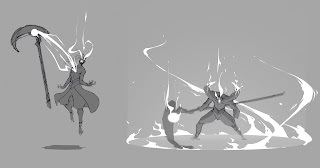 Additionally, unlike with Rhaast or vanilla Kayn, SA Kayn takes advantage of the shadow magic he has mastered to conjure a living shadow (yup, just like Zed's) to perform Blade's Reach for him, leaving Kayn free to continue with other actions. So a typical gank would be to use Shadow Step creatively to find a way in (always target squishies that are hugging walls), cast Blade's Reach before you even exit the wall and immediately follow up with Reaping Slash. The burst damage working in tandem with your SA passive is pretty incredible. Lastly, Umbral Trespass gains 200 bonus range (holy crap, again) and leaving your target resets SA's passive, giving you a fresh 3 seconds of bonus damage. Now, I want to address the whole "SA Kayn is terrible" thing. While I wholeheartedly believe that Rhaast is the ideal transformation in 95% of situations, there are certainly games where SA Kayn can run rampant. I don't actually build Trinity Force every game I choose to go SA, only when I'm pretty ahead. Otherwise abuse the 7.15 meta and rush Duskblade. Ghostblade and Mobility Boots help you get into position to take out a target quickly. GA is just a fantastic item on assassins, it also refreshes SA Kayn's passive which can really surprise enemies. Outside of these items sometimes you're forced to grab a Hexdrinker or Edge of Night to deal with some pesky champions (Teemo shrooms are a pain!). Like I stated, I plan to go SA Kayn in champ select, so I opt to take a Thunderlord's mastery page. What would benefit a burst assassin more? It's pretty easy to proc, especially thanks to the shadow cast of Blade's Reach straight into a Reaping Slash. Enrique's September 2017 Buy(er's Remorse) list! 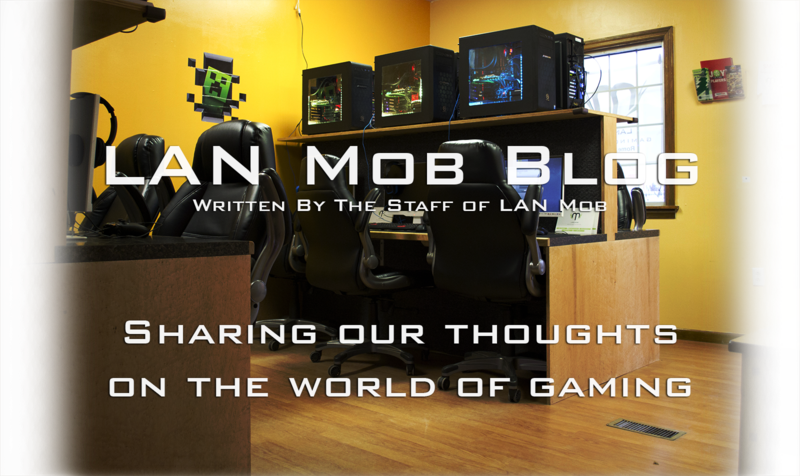 LAN Mob's 250th Blog Post! Next Games Activision Should Remaster! Hyped for Fire Emblem Warriors!